A sailor youth, bound for the Southern Seas, brought home to his betrothed a bunch of that pretty coralline known to the unlearned as the mermaid’s lace. The girl, a worker in points, struck by the graceful nature of the seaweed, with its small white knots united, as it were, by a “bride”, imitated it with her needle, and after several unsuccessful trials produced that delicate guipure which before long became the taste of all of Europe. JH: Mermaid’s Lace is one of your earliest digital works to explore a collage format. CP: Yes. I wanted to make a weaving piece from bottom to top. I wanted to make strings of images: a thread and within the thread the unfolding of a life, an episode, an event. In Louise Bourgeois’ work people often describe the thread on the spool as the ‘stuff’ that is yet to become, to be made into something in order for it to live. 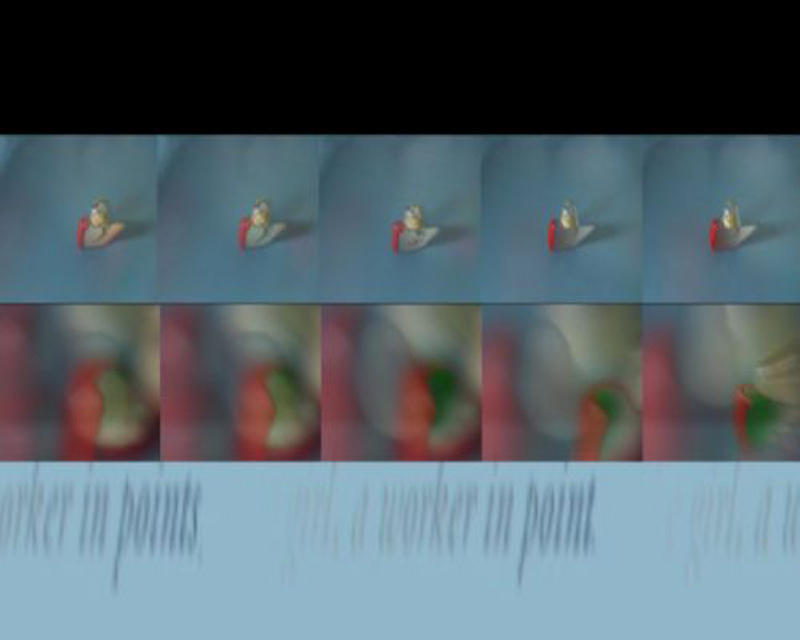 Achieving a comparable quality in moving images proved technically impossible, but there is the illusion, in this work, that the images are moving along and being rewound. The work is about the making of lace and the myths of lace. There is an Italian myth that suggests lace comes from the foam of the sea. The text at the bottom talks of a young man bringing a coral to his fiancé and she being so taken with it that she started making some point work and that is how the lace developed. The two little Russian dolls dancing are a story of union. But lace is to do with gaps, the loss and the emptiness that makes everything else work. So here the dolls are being knocked apart and then the sea and the coral lace appear. The idea is that from something to do with love something else happens that is not to do with love.